Once known as ‘Lane Xang’ or the ‘land of a million elephants’, Lao PDRs’ wild elephant population has dwindled to an estimated 400-600 individuals. Although 47% of the country is covered by forests, habitat loss has caused these remaining populations to become fragmented and isolated. Poaching and Human-elephant conflict are also areas of high concern for wild elephant conservationists. Laos has a long history and cultural tradition of keeping captive elephants. Due to low birth rates, some poaching, and illegal smuggling, only around 400 elephants remain in captivity today. Most are privately owned. Laos’ captive elephants work in logging, transport, ceremonial duties, and a budding tourism industry. Unfortunately, Laos’ captive elephants are often overworked, receive little to no health care, and many suffer in poor conditions. The growth of elephant tourism in the country could be beneficial if it is used to improve the elephants’ conditions and could possibly be linked to wild elephant conservation efforts. While there are a few riding establishments, there is only one facility Elemotion Foundation recommends in Laos. Founded in 2011, the Elephant Conservation Center (ECC) is located on 106 hectares of lush forest in the Nam Tien protected area. Home to 10 elephants, including two sets of mother and calf pairs, the ECC is a true conservation center and sanctuary adhering to the five freedoms of animal welfare. The ECC elephants do not work. They spend most of their time free foraging, socializing, bathing, and just being elephants. 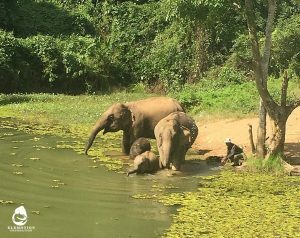 The ECC provides health care and rest for neighboring elephants in need, raises awareness about Laos’ endangered elephants, and is a model of sustainable, elephant-friendly eco-tourism. Visitors will enrich their elephant knowledge through the ECC’s robust educational program including guided museum, hospital, and nursery tours as well exciting first hand observations of natural behaviors. Feeding and photos are allowed at specific times. Get to know the mahouts as they are introduced with their elephants. Tourist numbers are kept below 25, so the animals and guests have the best experience possible. The ECC will arrange your transport from Luang Prabang in a comfortable air-conditioned van. The drive is about a two and a half hours. Minimum stays are two day/one night and volunteer opportunities are available. Accommodations are lakeside bamboo bungalows.